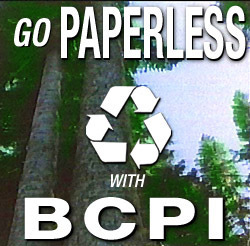 BCPI uses recycled paper that helps save trees and protect the environment. We also use soy inks when doing printing projects. We strongly believe going paperless and using recycled materials whenever possible help create a better world for all of us. Click below to download our PDF flyer to keep for you or to show a colleague on how you could minimize your paper waste and paper traffic.